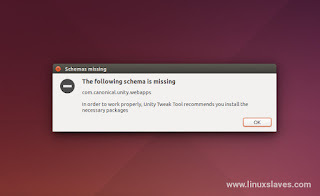 How to fix Unity Tweak Tool can't open - If you are a Unity desktop user, Unity Tweak Tool is a must-have app for Ubuntu. Unity Tweak Tool is customization tool for Ubuntu. This application lets you to configure appearance, behaviors and configurations including launcher, panel, workspace, themes, icons, cursors, fonts, and etc. In order to work properly, Unity Tweak Tool recommends you to install the necessary packages"
Nothing happens if you press OK button. So I write this post to solve the issue for you. Type your password and press Y to continue the installation. Step 3 - Violaaa!! No more Ubuntu "com.canonical.unity.webapps schema is missing" appears. These were all I can write about com.canonical.unity.webapps is missing when open Unity Tweak Tool in Ubuntu Linux. Thanks for visiting us!